The Wizard TS-130 is a new brushless 3” model from Eachine. The frame (like its larger brother the Wizard TS-215) borrows design inspiration heavily from the Hyperlite Floss frame. With its minimalistic top plate this little model looks like the only thing it is wearing is a G-string! The 130mm wheelbase might trick you into thinking that this might be a cool little indoor model for the cold winter months that have arrived. However, on 4S you will need excellent throttle control to fly the TS-130 indoors, without leaving propeller blades imbedded in the ceiling anyway! Eachine have really upped their game with this new brushless micro, the FPV camera is a Foxeer pro which has great color even in poor lighting conditions. The (200mW Max) VTX supports smart audio and has 'Pit Mode' which is great because this little guy punches way above his weight and deserves to be at the track. The 1507 4100kv motors look enormous on this little frame, and with Eachine claiming in excess of 600g (on 4S) of static thrust per motor (depending on your battery) you could be getting over a 10:1 thrust to weight ratio, which is even more enormous than those motors! 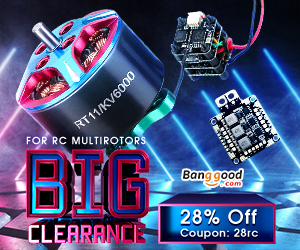 Get the Wizard TS-130 on Banggood, it's currently on discount. The Eachine Wizard TS-130 comes in a glossy white box with a logo featuring a tortoise wearing FPV goggles, I can promise that what’s in the box is faster than any hare you have ever seen! Inside is a manual for the VTX and FC, the FC instructions however are for a different F3 board than the Omnibus F4 that is provided, so be careful! You get a bag with 2 CF spanners and an allen/hex key, 2 full sets of props, a battery strap that is sadly too short for a 4S pack, a CF battery protection plate and a silicone anti slip mat for the battery. The selection of extras that Eachine provides is very impressive for a lower price model. In fact there is very little extra that you could ask for, apart from possibly a controller for the FPV camera settings, but even with more expensive models this is usually excluded, thankfully my camera was configured well. Lastly, there are some high density foam 'feet' that you can stick under your, erm... arms? Sounds like a funny place to put feet, but whatever floats your boat man! I initially thought that the top plate was fibreglass, but I can confirm that it is electrically conductive and therefore it is carbon fiber. The chassis is a single piece of 3mm CF, the model would be heavier with replaceable arms, so I understand their exclusion here. The urban camo colour scheme is cool, but the finish isn't perfect. I can say that all the nuts, grub-screws and screws for the motors, frame and stack were all well tightened on delivery, I still always advise removing the motor and frame screws and adding some temporary (blue) thread locker, so things stay tight despite the inherent vibrations. I would like to see a little more protrusion at the front of the top-plate, or a bit more of a substantial camera mount to protect the FPV camera a little more. The Wizard TS-130 ships with 2 full sets of DalProp Cyclone 3056 Tri-Blades, (one blue set - 2xCW and 2xCCW and one clear set 2xCW and 2xCCW) these aggressive little props work really well with these high torque 1507 motors. I have to say I am pleasantly surprised to find eachine providing some great quality props on a model in this price range. The Eachine branded 1507 4100kV motors are very notch-y, showing strong magnets have been used have been used in their construction. The magnets are flat, rather than the concave segments used in higher end motors, they still provide great torque, but I think that efficiency may suffer slightly due to this. The motor and prop combo however really rip! Incredible acceleration and blistering top speed really rocket you through the air. The 4-in-1, 20A, DShot 600, ESC’s were all configured with BLHeli_S firmware and running the motors in the correct direction on delivery. They run the motors smoothly all through the throttle range and despite being quite warm after flying, I don’t think they are likely to burn out unless you are full throttling for excessive periods. Eachine could have gone a touch further by adding a capacitor to the battery terminals on the ESC and although a bit of interference in the video is discernible, it is easy to ignore and far from a deal breaker. The Flight Controller is an Omnibus F4SD Flashed with BetaFlight. The PNP version comes as stock with a PPM or Serial RX wire ready soldered to the board, they are a bit long, but as you experienced quad builders out there will know well, wires are better too long than too short. The Flight Controller is an Omnibus F4SD Flashed with BetaFlight. The PNP version comes as stock with a PPM or Serial RX wire ready soldered to the board, they are a bit long, but as you experienced quad builders out there will know well, wires are better too long than too short. Like most 20x20mm FC's this doesn't have a black box logger, barometer or super fast LoopTime, there is also a bit of tuning required to eliminate the oscillation at high throttle, but aside from this it does its job well. The VTX comes locked to 25mW output power, however HAM license holders can easily unlock the VTX to output up to 200mW, it also has Pit Mode and supports smart audio. It has a board to board pin connection to the FC and an IPEX connector for the pre-installed linear antenna. Similar to many 20x20mm VTX this has no digital display to show channel and band, so you will need to look at the instruction manual for the VTX to decode the LED flashing sequences showing band channel and output power. The FPV camera is a Foxeer Arrow Micro pro, it is nice to see one of the cheaper quads on the market coming with this quality of component. Sadly Eachine have neglected to include a camera controller so unless you already have one you will be stuck with the default camera settings. Still, the defaults were fine for me. The camera has 600TVL (650TVL in black and white mode), and supports a wide input voltage from 5-40v. With this 3” I would use a 4S 650mAh - 850mAh pack, it does produce enough thrust to carry a lightweight 4S 1050mAh pack, but the battery would just be too big to bottom mount comfortably. The thrust when using a 3S pack would better suit a beginner, but as you can change throttle settings, there is no reason to use a 3S pack here. The first thing you notice on take off is that the TS-130 is fast, like, really FAST! I get about 2.30 - 4.00 minutes of flight time depending on how heavy I am with the throttle. It is difficult to just cruise around with this little bird though, because there is so much more punch it has to give. As I mentioned earlier it does require a bit of tuning to eliminate the high throttle oscillations, personally I find there is still plenty of power available below the level where the oscillations start, so even out of the box it is absolutely riotous fun to fly! The 1507 4100kV motors are excellent and very well paired with the DalProp 3056 props – a combination capable of producing huge amounts of thrust - as much as 2.5kg (max total static thrust) if Eachine's figures are to be believed! The FPV camera is great, showing beautiful colour in poor lighting, and even with the VTX on 25mW I have flown out to almost 300 meters with minimal interference. The board to board pin connections are simple and quick to disconnect, which is a great help when installing your RX or for general maintenance. Unless you are using a really heavy 850mAh pack, this model should remain under the 250g weight limit imposed in many countries. The TS-130 isn’t the best quad for an absolute beginner, it is just too quick, but as a second or third model this is a brilliant addition to any fleet! The eagle eyed among you may notice that the props pictured are actually iFlight Nazgul 3061 props. The really eagle eyed might see that there isn’t any heat-shrink insulation on the legs of the capacitor, that is because I didn’t have any heat-shrink that was thin enough. What I have done as a temporary fix instead is heatshrink the standoff between the legs. I have also added a touch of electrical tape over the FC, where there is a chance that it may touch the cap legs, insulating against a short in this area too. Please don’t do this at home!!! If you want to add a cap to the model make sure you order some fine heat-shrink too. Time constraints to publishing this review forced me to make a quick fix, do as I say not as I do! This is a wicked fast little quadcopter for a very reasonable price, it has some great quality components such as the Foxeer FPV camera, the 1507 motors and DalProp Cyclone props. The VTX support for smart audio and pit mode are great features, it’s nice to see them become commonplace even on cheaper models. It has an instruction manual, admittedly only for the VTX, but as this isn't an ideal model for the first timer, it is almost unnecessary to have more detailed instructions. There is a bit of oscillation at very high throttle which is proving a little difficult to fully tune out. There is some interference in the video feed from the motors, so adding a low ESR capacitor (25v 1000uF) to the battery connectors on the ESC is advisable. I haven't done this yet, but I'm hoping that it might help clear up some of the high throttle oscillations by reducing the noise to the FC. It would have been nice for Eachine to add a cap for us, but hey ho. The failure to include the controller for the FPV camera is a small irritation (larger if you do need to change the camera settings). Realistically though, there is very little to complain about - the Eachine wizard is a great fun, inexpensive, lightweight and super quick little 3” that has some really good quality components! I managed to disconnect the Negative battery lead from the ESC, which actually ripped the solder pad off, thankfully there are pads on both sides of the board, so when I resoldered that I added a capacitor (25v 470uF). Annoyingly I ripped the bottom pad off the ESC as well, so I found a common ground and soldered the battery wire to that. My advice would be to install a cap (25V 470uF or 1000uF) and then add healthy drop of hot glue and some well placed cable ties to relieve any stress that might be transferred from the battery leads to the solder terminals.